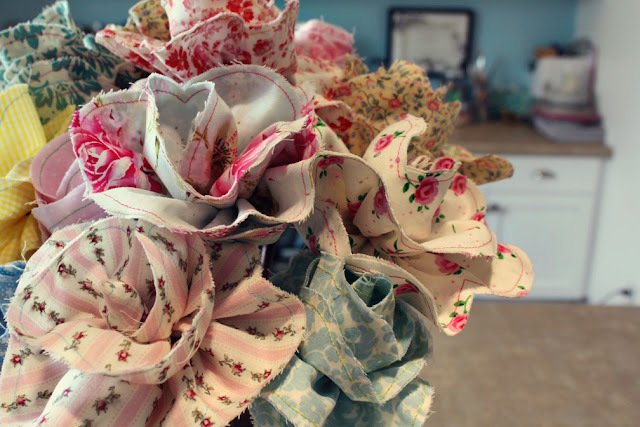 Last spring, my bloggy friend Anj @ SnowyBliss posted these beautiful fabric roses. I've wanted to make some ever since. I finally got around to it recently. The one thing I wanted to change, though, was to finish the edges. I'm sharing the way I made my version, but I don't really consider this a tutorial as I heavily relied on Anj's tutorial. Let's just call it my variation on her theme. I matched them right sides together, pressed well, and then traced a scalloped pattern with my water soluable pen. I sewed along the scallop line, 1/4" in. and also notched at the joint between scallops. Sew a gathering stitch along the rest of the unfinished edge. Now you're ready to assemble. I gathered some sticks from a broken branch. They were the perfect color for a rose stem. Using hot glue, insert a stick into part of your scallop (opposite end of where you ironed under the edge). Bunch the fabric around the stick to make a bud shape. After pulling those gathering stitches tight, wind the fabric around the bud, gluing as you go. When you get to the end, make sure the folded side covers up the gathers. For fun, I cut some wool felt leaves, and added them to just under the flower and a few on the stem. The best part about these flowers are they are so customizable! I hope you make some, whether following Anj's tutorial, or my variation on her theme. 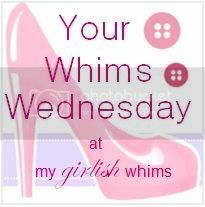 Featured on Someday Crafts, My Girlish Whims, and Freckled Laundry! Beautiful! Good tutorial too, you make it look so easy! I love it! You are so clever!! Very cute! Love them in all the different fabrics! I bookmarked the same tutorial! Yours turned out great. I've been wanting to make these for so long and this has inspired me to push this project up to the top of the list. Maybe tomorrow..... I can't wait to make some for my daughter's room! I'm pinning it! I have to find some time to make some of these. These are so fun! I love the bright colored fabric you used, and they look great on your mantel! So sweet Chris! Both versions are really quite pretty and give a whole different effect. I like the use of real-life honest-to-goodness stems too. Nifty! these are so pretty! wow! I love them! I found your blog while blog hopping and i LOVE it! I am your newest follower and would love it if you would check out my blog and follow my blog too! Thanks! wow, these are beautiful, I just might have to try these. I love that they look so much like real flowers. So pretty! Beautiful, Chris. I love the colors you used for the roses in the bottles. So pretty. Gorgeous roses and a great tutorial too! Simply beautiful! I saw these on the other site a while back and highlighted them and my viewers loved them. I like yours so much I will highlight these today. Thanks for the beauty you share with the world! They are lovely! thank you for the tutorial. I have never seen fabric flowers done this way. Both techniques turn out so lovely. I also love the selection of fabric, such a pretty bouquet. Those are so original and beautiful! I love them all bunched together! Great fabric choices. I made some of these ages ago. Nice reminder to make more with new fabrics. Fabulous! How pretty in the vases and as a bouquet. I would love for you to share the flowers at my Open House party. What a great tutorial! Just what I was looking for! Glad I found you. Now a follower :) Have a great weekend! Chris. These are FABULOUS! I love em'! You are one talented lady! Those look so beautiful, I love the finished edge style. These fabric roses are awesome! You've inspired me to want to try these! Thank you for linking up to Sew Woodsy last week. We hope you'll come back today and link up another craft project! Beautiful! I have been looking for a gift for a friends birthday this weekend and these are perfect. Thanks for sharing.